Tension is on the rise. It is boiling over and there appears to be no turning back. War is here and it is going to be a bloody one. One of the instigators is Anarchy, undoubtedly the fastest-growing league currently in the realm, gaining achievements that some have taken years to get and others are still yet to gain. Anarchy's rise has been a quick one, doing in a matter of months, what many have taken years to obtain. Yet this rise has come with a price. Anarchy through its ultra-aggressive nature has made many enemies and many of these enemies are already plotting the demise of this upstart league, attempting to cap their success. One league that Anarchy has found itself in escalating conflict with is the Knights Templar organization and its four leagues. 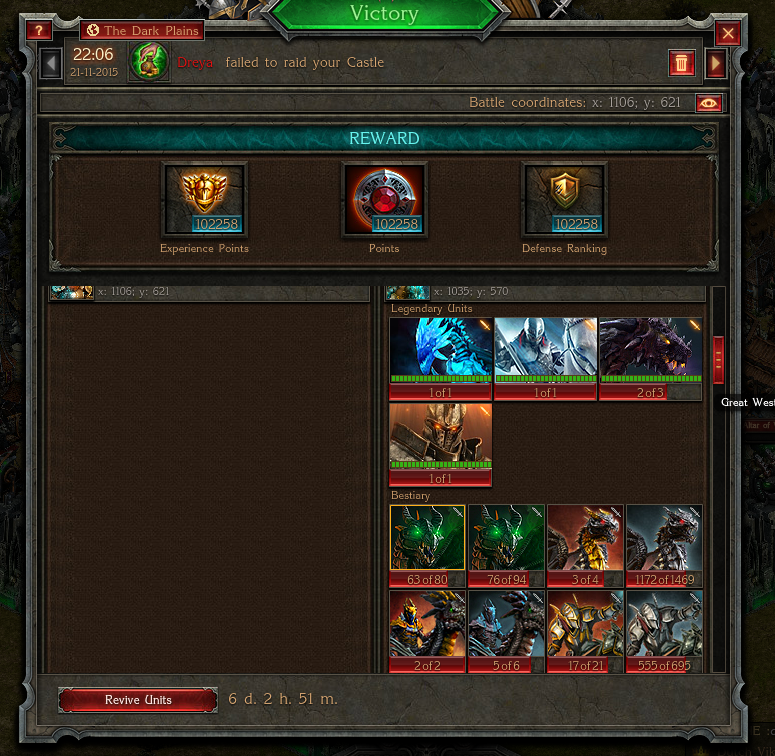 In the past, the Chronicle has discussed how these two great leagues have found themselves at each other’s throats: members have raided one another's strongholds, pillaged each other’s resources and wiped out entire armies in their disputes. Now, the boiling point has been reached. 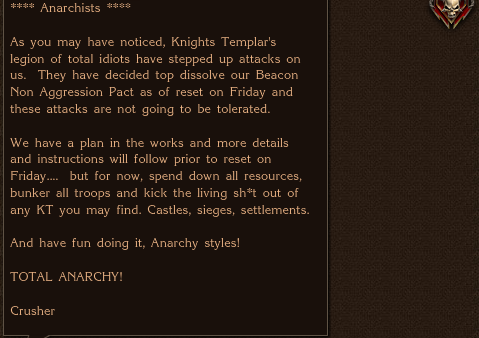 The Knights Templar has called for the utter wiping out of Anarchy off the map. This call came first from The Knights Templar 4 as they plotted to take and destroy Anarchy’s seats of power, their beacons. Hearing of this, Anarchy immediately went on the offensive, knowing that to hold their own against the onslaught of four leagues, including the current #1 league in the realm, then they would need to do what they do best: Attack first. Key members of Anarchy struck out, targeting Captains of the Knights Templar and others who foolishly had their defenses out. 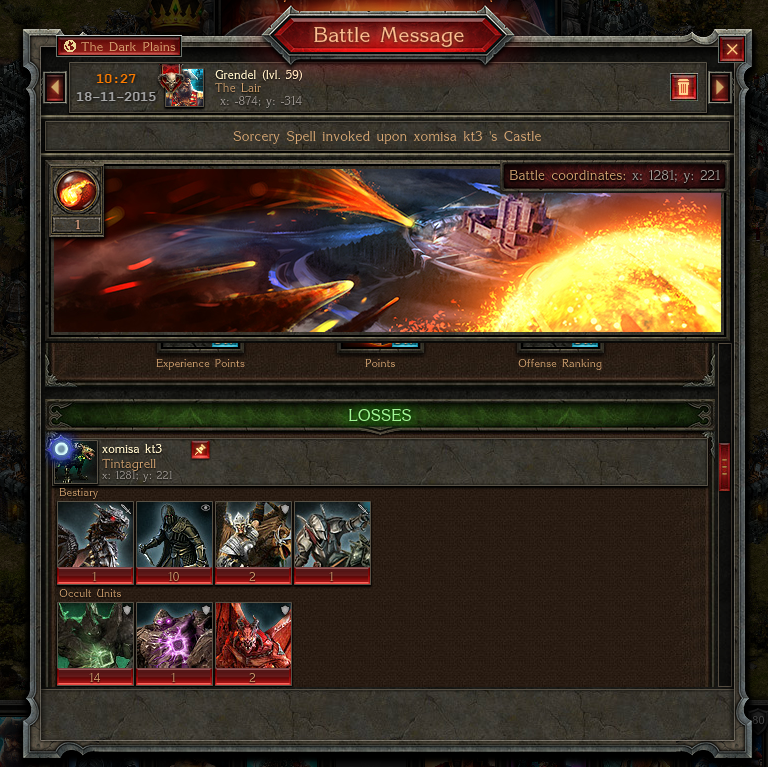 The Knights Templar responded in kind, invoking great spells of sorcery bringing down their fiery wrath on their opposition. All during this time, Anarchy prepared for the worst, knowing that there was a high probability that the Knights Templar would assemble their incredible might and begin the siege on Anarchy's beacons. 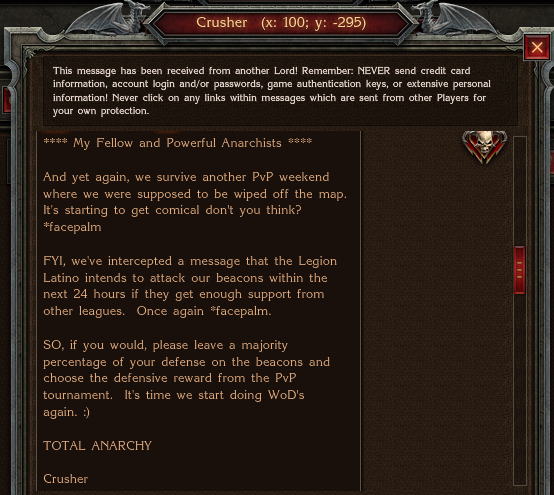 As the weekend passed and the fighting slowed to a less intense pace on both sides, the leadership of Anarchy responded and congratulated their members on their success of not getting wiped off the map as they were threatened with. Although Anarchy has survived this round of battles and scored some severe hits on the strongholds of The Knights Templar members, the war is far from over. Once again the Knights Templar is in talks of assaulting and destroying Anarchy once and for all. For now, the Chronicle anxiously awaits the next story to unfold in this historic battle. 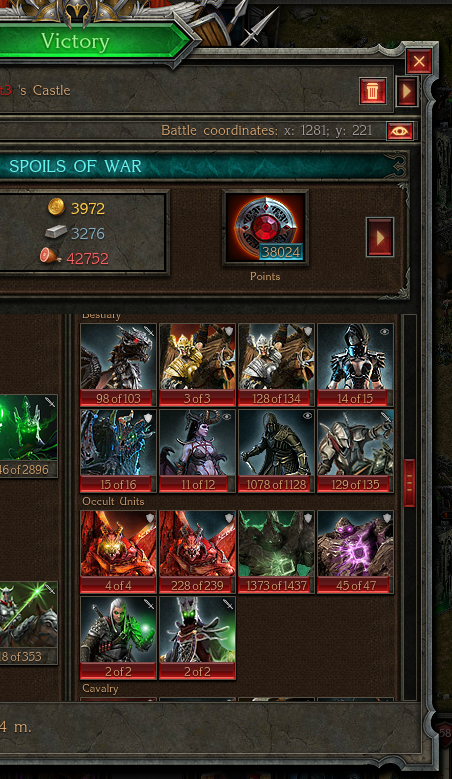 Will Anarchy survive the onslaught that KT has planned, will their rise be cut short? Or will the Knights Templar decide against hitting Anarchy's strongholds? The answer to these questions are yet unknown, but rest assured, there will be much more bloodshed before the end of this story and the Chronicle will be there to report.